GEOTHERMAL ENERGY is the energy stored in soils, rocks and liquids that fill pores and rock crevices. It is constantly complemented by a stream of heat transferred from the hot interior of the Earth to the surface, which is why it is inexhaustible. The heat in the interior of the Earth is partly the primary warmth created during the formation of our planet, and partly is the heat coming from the decay of radioactive elements, such as uranium, thorium or potassium. The temperature increases with depth, reaching even 6000 degrees Celsius in the Earth’s core. 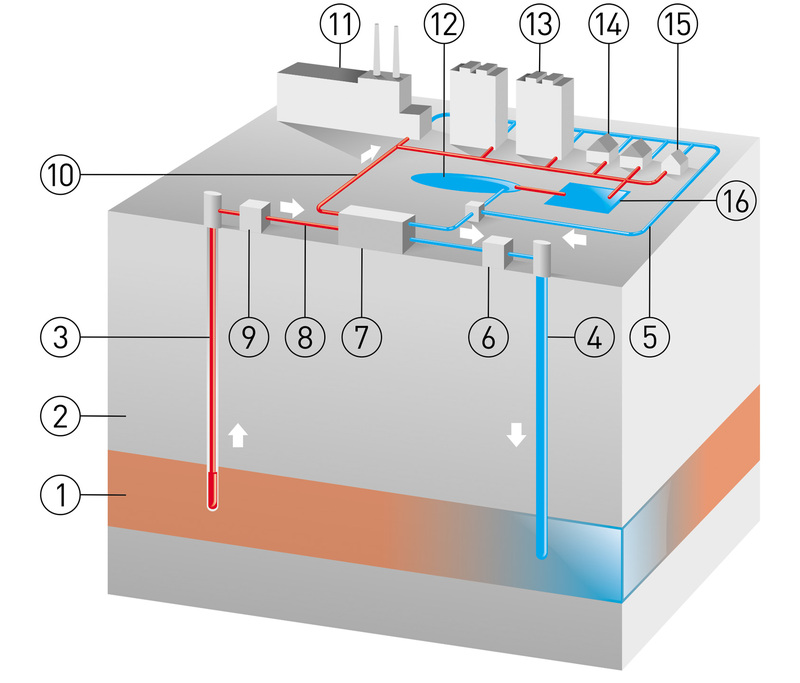 The geothermal hot water exploited by the production well by a submersible pump is directed to plate heat exchangers located in the surface part of the installation. In the exchanger, geothermal water transfers heat to the independent secondary water circuit. The water in secondary circuit feeds the consumers’ heating systems. The geothermal water cooled in the exchanger is guided by an industrial pipeline to an absorbent hole, which is injected into the aquifer.